The acanthus leaf is a timeless design in traditional carving that every aspiring carver must learn to master. 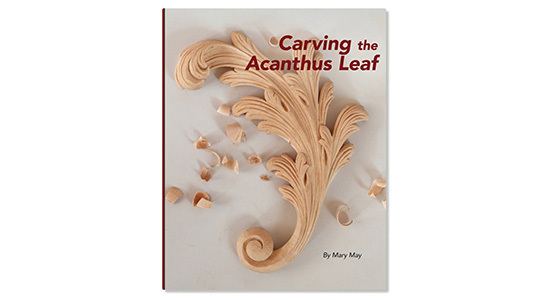 In this book, Mary May explains the each step of carving the acanthus leaf in detail, gradually building from a simple design to more ornate carvings. This book progresses through thirteen variations of the leaves. Each chapter includes a discussion of of how the particular leaf design is featured in architecture or the decorative arts, and the complexity of the leaves slowly builds over the course of the book. Each variation on the leaf has over a hundred photos and illustrations showing each step of the carving process. "Carving the Acanthus Leaf" is a beautiful and durable book, designed to survive many hours of use in the shop. Complete with antidotes of Mary May’s experiences as a wood carver, reading "Carving the Acanthus Leaf" is like apprenticing with a master carver. Lost Art Press, 2017. Hardcover, 311 pages. Printed and bound in the USA.